Recently, on a trip from Zeeland in Holland to Frankfurt in Germany, I had a beer in Antwerp in Belgium. I am not a beer drinker, but being in Belgium, I thought I should have a beer with my salty waffle. In fact, I let my daughter Katharina Schiller order the beer for me. What I got was beer with 8,5% alcohol, an alcohol level very typical for a sweet-style Kabinett or Spätlese from the Mosel Valley, which was not far away. And, as Katharina said, there are beers with much higher alcohol level, including in Belgium. And, finally, like neighbor Holland, Belgium is also an emerging wine producer: I could have had a Belgian wine! The Belgians have been brewing beers since the Middle Ages. The country produces more than 450 different varieties of beer and has approximately 125 breweries. Perhaps the most famous of all the Belgian beers is Lambic beer. This is made using an ancient style of brewing, which relies on spontaneous fermentation to produce a very dry and naturally gassy beer that improves with years in the bottle. Gueuze is a famous Lambic beer, produced by mixing a young Lambic beer with more mature vintages. Trappist beers are ales brewed in a Trappist Monastery. The production process for this beer must be carried out, or supervised on site, by a Trappist monk to qualify for this category. At the moment, there are six monasteries in Belgium that meet this requirement. Brands include Chimay, Orval and Achel. The Economist: As well as having a good claim to brew the best beer in the world, Belgium is also home to the world's biggest brewer. Anheuser-Busch (AB) InBev, based in Leuven, a small university town half an hour by train from Brussels, turns out one in five of every beer sold around the world. Belgium also makes a bigger range than any other—1,131 at the last count. Apart from six Trappist ales and other abbey beers, it churns out lagers such as Stella Artois and its stablemate Jupiler, the more popular brew in Belgium. Tipplers can also choose from an array of wheat beers, brown ales, red beers from West Flanders, golden ales, saison beers based on old farmhouse recipes, and any number of regional brews. Oddest are the austere, naturally fermented lambic beers of Brussels and the nearby Senne valley, a throwback to the days before yeast was tamed. These anachronisms have survived only in Belgium. The country generously shares its creations with the rest of the world. It is one of the biggest exporters of beer in absolute terms and as a proportion of national production (statistics boosted by the worldwide thirst for Stella Artois). More than half the booze it makes is sent abroad. Picture: Antwerp is located on the river Scheldt, which is linked to the North Sea by the Westerschelde estuary. The city has one of the largest seaports in Europe. Belgium only recently began re-establishing a domestic wine industry. The Romans had established vineyards and made wine in Belgium 2000 years ago. However, this had come to end as a result of the colder climate in the 15th century. The recent climate change helped to restart winemaking in Belgium. Modern winemaking in Belgium was initiated by Jean Bellefroid. During World War II, Bellefroid went to Moselle in Germany. There he worked in a vineyard and learned how to make good wine. He start his vineyard in 1963 in Borgloon. There are now a number of vineyards, totaling about 200 hectares. Wine production occurs in both Wallonia and Flanders. 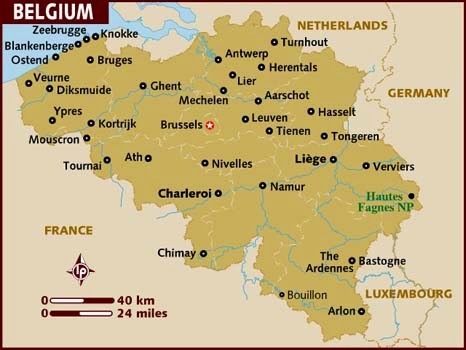 Belgium has five officially demarcated Appellations d'origine contrôlées (AOCs), four in Flanders and one in Wallonia, and two Vin de pays regions. AOC Hageland in Flemish Brabant close to Leuven was the first AOC, created in 1997. AOC Haspengouw (Hesbaye) followed in 2000, located in Limburg, close to the border with Netherlands, and home to Belgium's most famous and largest wine producer, Wijnkasteel Genoels-Elderen. AOC Heuvelland followed in 2005. There is also an AOC for sparkling wine from Flanders, Vlaamse mousserende kwaliteitswijn, created in 2005. The first Wallonian AOC, Côtes de Sambre et Meuse, was created in 2004, and is situated between the rivers Sambre and Meuse, in the vicinity of Liège. The two Vin de Pays (country wine) regions cover Flanders and Wallonia, respectively. The Flemish country wine is simply designated Vlaamse landwijn, while the Wallonian country wine carries the name Vin de pays des Jardins de Wallonie. Around 90 percent of the production is white wines. Most of the grape varieties planted are the traditional vitis vinifera grape varieties (e.g. Riesling, Pinot Gris, Rivaner, Pinot Blanc, Auxerois, etc). French American hybride grape varieties that resist mildew diseases better and ripen quicker, but lack a bit the elegance of the traditional vitis vinifera grape varieties, are also planted. They are, however, much more popular in neighboring Holland. Belgian wines are mainly sold to vineyard visitors or distributed in local shops and restaurants. Emerging Wine Country Poland: The Early Days of a Climate Change Gainer? New World wine country: New Zealand - facing the fate of neighboring Australia?